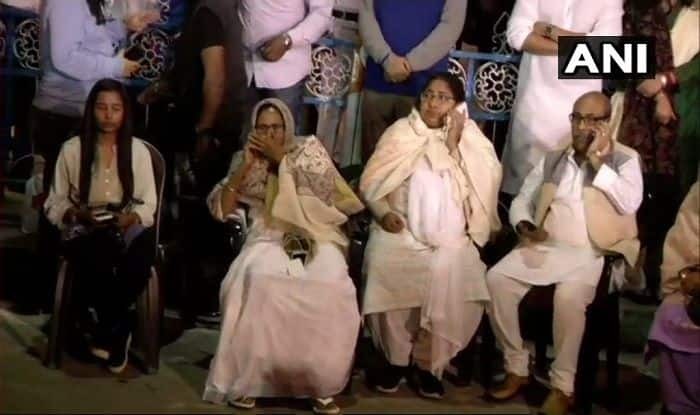 Mamata Banerjee began her dharna on Sunday in protest against the imminent questioning of Kolkata police chief by the CBI. Kolkata: West Bengal Chief Minister Mamata Banerjee and the BJP-led Centre are at loggerheads again, this time over the CBI’s move to interrogate Kolkata Police chief over the chit fund scam. Banerjee has skipped meals and stayed awake on the dais along with some of her senior ministers. Other leaders who have voiced their support for the Trinamool Congress chief are former Uttar Pradesh Chief Minister Akhilesh Yadav, Madhya Pradesh Chief Minister Kamalnath, Delhi Chief Minister Arvind Kejriwal and Gujarat MLA and Dalit leader Jignesh Mevani. Meanwhile, many TMC supporters have been flocking to the area, shouting slogans. Banerjee began her protest on Sunday in protest against the CBI’s attempt to question Kolkata Police chief Rajeev Kumar in connection with the chit fund scams. She tweeted that the BJP leadership was “doing the worst kind of political vendetta…they are misusing power to take control of the police and destroy all institutions”. The CBI team which went to Kumar’s residence was denied permission. The agency wants to quiz Kumar, who led a Special Investigation Team of West Bengal police probing the scams, regarding missing documents and files. Several political leaders, including Congress president Rahul Gandhi, Kejriwal and Andhra Pradesh Chief Minister M Chandrababu Naidu came out in support of Banerjee. The row escalated on Sunday but it had been threatening to get out of control since Friday last when the CBI claimed that Kumar, a 1989-batch IPS officer of West Bengal cadre, was ‘absconding’ and ‘being looked for’ in connection with Saradha and Rose Valley ponzi schemes. The Kolkata police dismissed the same. “Please take note that not only is the CP Kolkata available in the city but has also been attending office on a regular basis, with the exception of January 31, 2019, when he was on leave for a day. All concerned may please take note that if any news is spread without proper verification, Kolkata Police will initiate strict legal action against defamation of both the CP Kolkata and Kolkata Police,” the police said. Meanwhile, reports say that the CBI will move the Supreme Court today to present its case.